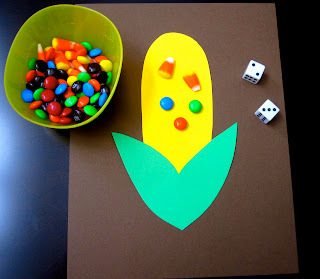 I tweaked this activity from No Time For Flashcards because I'm too lazy to make lots of ears of corn. It was so fun that now I think I'm going to make one for each of the kids coming to our house for Thanksgiving. 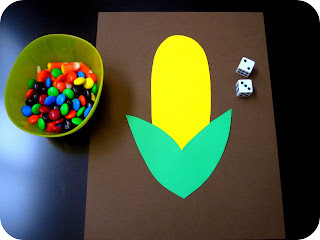 This game involves counting and candy... so of course it was a hit! Materials Needed: colored cardstock (yellow, green, brown), double-sided tape, scissors, dice, candy corn and M&Ms. 1. Cut out a corn stalk and corn and then tape them onto the paper. 2. 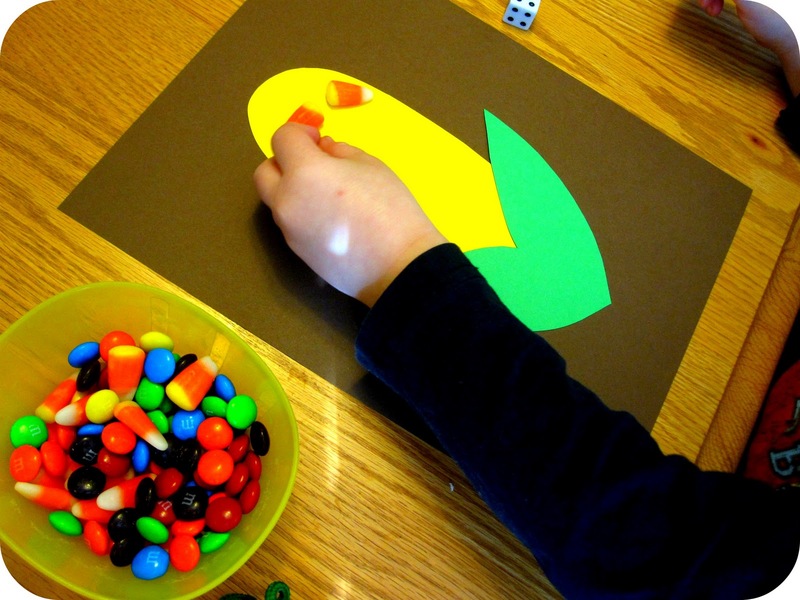 Put your candies in a bowl to keep nearby. 4. 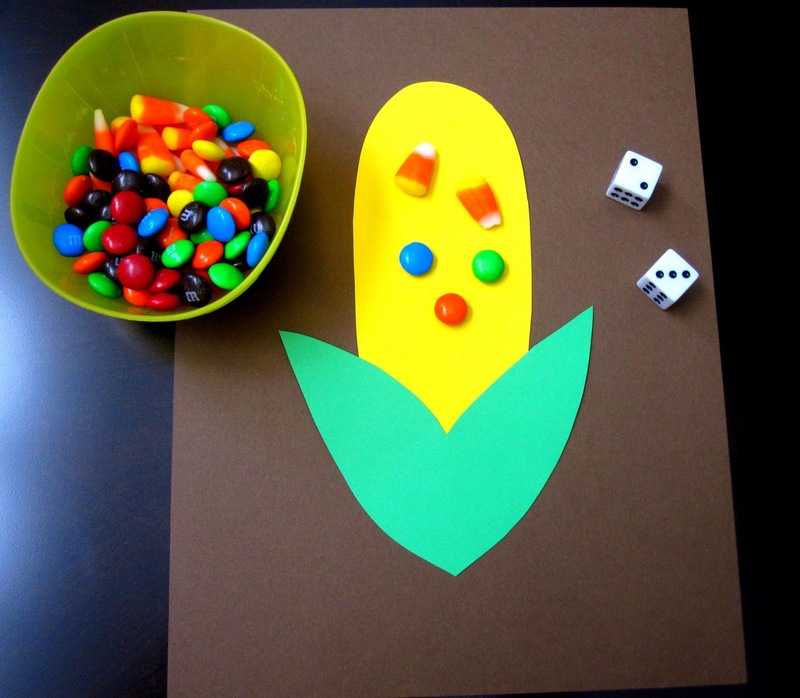 Add the correct number of candies onto the corn stalk (based on the numbers facing up on the die). 5. Eat some candies and then start again. Make sure kids are supervised while they are playing this game. Kids under 3 should not be playing with dice (they are a choking hazard), but if you are supervising them (making sure they don't put them in their mouth), it should be ok. If you have large dice for younger kids (or want to make a paper set), do that instead. 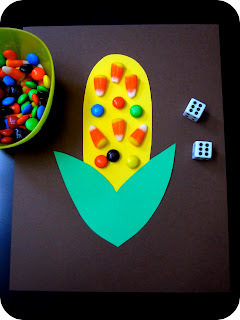 - Create patterns with the candy corn and M&Ms on the corn. Do you think the adults at my house are going to want their own M&M Corn Roll game sets? I think I would! What other skills could you embed into this activity? This is a supercute idea. We still have leftover candy, too! I LOVE this idea!!! Well done! I thought I commented - ack, I am really loosing it! I love this , and I adore that we can inspire each other. Totally loving where you took this!